You are here: Home / dinner / beef / Taco Wraps! I don’t know about you, but I am helpless in the face of anything that has the word “taco” in its title. Taco salad, baked taco potatoes…you know it is only a matter of time before I figure out a way to turn tacos into soup, but in the meantime, here’s a version of the regular old taco…only in wrap sandwich form! Not that I have anything at all against those crispy crunchy taco shells, but every one in a while I like to eat my taco without the 50% chance of it breaking into pieces and falling into my lap on the first bite. 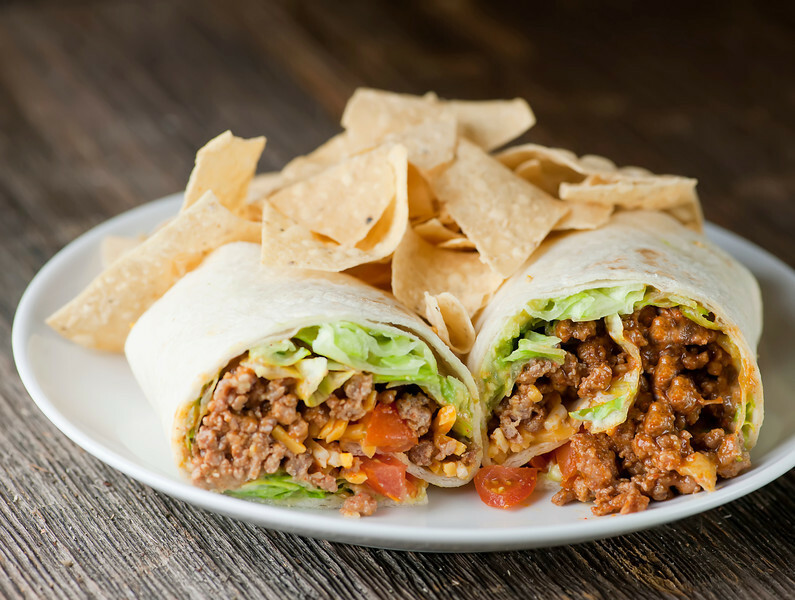 It’s a calming experience, and for those times…taco wraps! I also find that I can add even more of the “fixings” into a taco wrap vs a taco shell, and the odds of getting an assortment of them in one bite (as opposed to a mouthful of just, say, sour cream and taco shell) are much better. Side note: this post is turning out to be a tad bit mathematical, isn’t it? Yikes! The preparation for a taco wrap is pretty much the same as it is for your regular taco…you round up whatever ingredients you like in your taco. I like spicy ground beef cooked with taco sauce, a generous amount of mixed cheddar and jack cheese, crispy shredded iceberg lettuce and some chopped tomato as a start. That sour cream and a little guacamole are always fun to have…maybe some sliced onion, maybe a little salsa…you get the drift! Assemble whatever you like best, and now here is where the taco roads diverge. Instead of the shells, you want some soft flour tortillas. Now, ordinarily I am a fan of corn tortillas, but since we are simply going to warms these up (instead of cooking them) and since we want them to be nice and flexible, we want the flour variety. Corn tortillas tend to be a little grainy and have a tendency to tear, neither of which will make for a happy wrap experience. So go for the flour tortillas and heat them up until they are warm – I usually just pop them in the microwave for about 10 seconds, but you can also wrap a stack of them in foil and pop them in your oven for a little while. Once they are nice and warm, spoon whatever conglomeration of ingredients you like onto the bottom third of your tortilla. You can fill it all the way to the edge of that bottom third, since that is where we will start rolling it. You can either do it in layers as in the picture above, or you can toss some of them together (the cheese, meat and tomato, for example)…you be you, taco-wise! Now, starting at the bottom third of the tortilla where the filling is, start carefully rolling it towards the opposite edge. If you want to be all neat and tidy you can fold in an inch or two of the left and right sides before you roll, so everything is all nice and tucked. Slice it in half (or not! ), and then you are just a few tortilla chips on the side from the first bite of your favorite new sandwich! Any of the following as garnish: chopped iceberg lettuce, sour cream, guacamole, salsa, etc! Saute ground beef and onion in a medium frying pan over medium high heat until beef is brown and onion is tender. Stir in taco sauce until heated through. Heat the tortillas by either putting them in the microwave for about 20 seconds, or by wrapping them in foil and heating them in a conventional oven for about 15 minutes at 375. Assemble as follows: divide the meat mixture among the tortillas, placing it at the bottom third of the tortilla. Top with cheese and your choice of garnish. Starting with the filling end of the tortilla, slowiy roll it up, tucking the side ends in towards the center if you like. Cut in half and serve at once. I think taco wraps are actually called burritos. These look good. I love a fish taco made with a soft corn tortilla. Oh, fish tacos! I love ’em too. In my mind, burritos have beans, rice maybe and meat. Springfield, Illinois has a restaurant called the Jolly Tamale. They have an offering called a Sancho. It’s essentially what you have there only really tightly packed. LOVE them! Gotta have sour cream though! Tacos should be eaten every way possible! I’ve never tried them in a wrap before…but it sounds like a good thing. Delicious!! I love any recipe that includes the word taco ;) can’t wait to bite into this! I agree – taco EVERYTHING! These look amazing, I’m thinking tacos tonight. Growing up we always just called these tacos. I’m told my older brother would have all out toddler meltdowns if his taco shell broke before he was done eating it. So only soft tacos for us. Not as efficient, but since you are doing this assembly-line any way – griddle your tortillas. Makes a taste difference…. There is a taco soup….which happens to be my grandson’s favorite. Love it. Taco Soup! Sounds scrumptious – I may need to come up with a version of that!